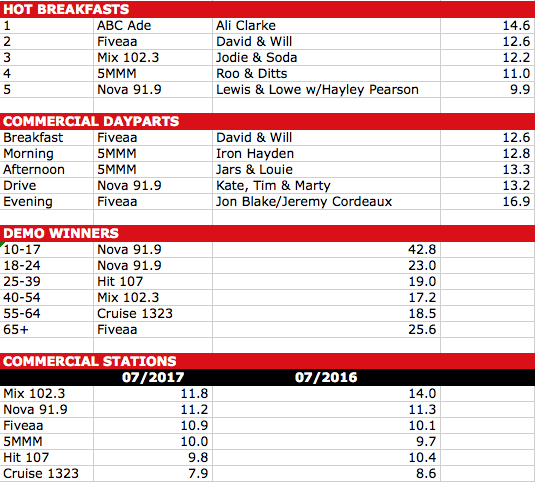 A drop of 0.6 didn’t see the station lose top spot, but it is the lowest Mix share of the year. Breakfast with Jodie and Soda narrowly posted its best result of the year with share up 0.1 to 12.2%. Breakfast improved on that number five times in 2016 though. Most dayparts were flat with share peaking at 12.4% in afternoon. Mix remains #1 40-54 on 17.2% while it was rolled by Triple M 55-64. The quiet achiever has posted its equal best result of 2017 while breakfast with Lewis and Lowe with Hayley Pearson is on 9.9% (-1.1) where it has reached single figures for the third time this year. 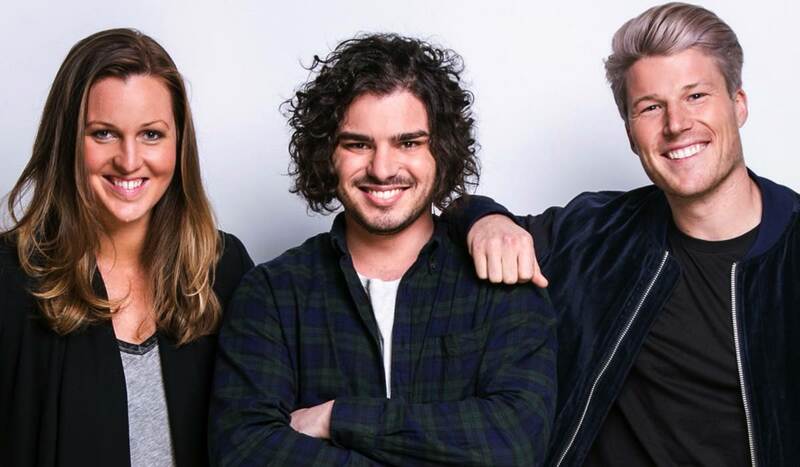 Drive with Kate, Tim and Marty remains #1 despite shedding 1.2 to 13.2% while Smallzy has helped Nova to #1 FM nights with share up 1.4 to 11.6%. Nova has regained top spot 18-24 from Hit and remains #2 behind its rival 25-39. 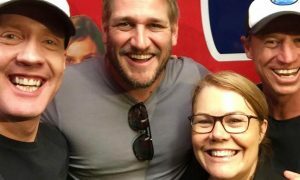 David and Will hold on as #1 commercial breakfast with share up 0.2 to 12.6%, which is only their second time under 13% this year. The station continues to perform best in terms of share in the evening with 16.9% – up 2.3 this survey. Share 65+ remains over 25%. A fall of 0.7 sees the station just holding in double figures. Breakfast with Roo and Ditts dipped 0.4 to 11.0%, which is their fourth consecutive survey at 11% or better. Morning, afternoon and evening were all down just a little with drive hovering in single figures on 9.7%. That station knocked off Mix to be #1 FM 55-64, only trailing Fiveaa by 0.2 to be overall champ in that demo. The biggest mover in the market put on 1.8 to record its second-best share this year. Amos, Cat and Angus in breakfast added 2.0 to 8.8% to also record the show’s second-best number in 2017. Morning, afternoon and drive were all up with Hamish and Andy adding 1.9 in the latter to 11.0%. Hit narrowly lost leadership 18-24 to Nova, yet it remains #1 25-39 after share lifted 2.7 to 19.0%. 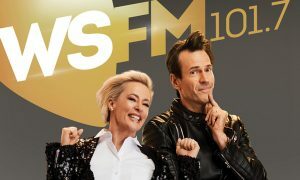 The station has posted its lowest 10+ share since survey three 2016 while breakfast on 6.6% has posted its lowest survey result in over two years. Most dayparts were hammered with morning down 3.7 and afternoon dropping 3.0. The station remains #1 55-64 though with share up 3.2 to 18.5%.